This PDF 1.5 document has been generated by Microsoft® Word 2010, and has been sent on pdf-archive.com on 03/02/2017 at 15:48, from IP address 178.190.x.x. The current document download page has been viewed 1760 times. File size: 613 KB (13 pages). effectively adapting semantic similarity measures in SNOMED-CT and provides an insight into its state-of-the-art. and knowledge based methods (Garla and Brandt, 2012a). paradigms (Bizer et al., 2009; Iosif and Potamianos 2015). measures that used SNOMED-CT as a knowledge source. biomedical knowledge sources are presented in Section 2. Section 5, biomedical reference standards are introduced. presented in Sections 7 and 8, respectively. earliest definition of ontology is that of Neches et al. privilege of some individual, but accepted by a group. (Sicilia, 2014; Campbell et al., 2013, Duarte et al., 2014). ontology is included in the UMLS repository. Fig. 1 shows the hierarchical structure of SNOMED-CT.
root node of all concepts is ―SNOMED-CT‖. can be applied to access these knowledge sources. research purpose, but a license is needed. taxonomy (taxonomy refers to the particular classification). and how they are calculated. as shown in Eq. (3). range depends on the depth of the taxonomy. measure using the parent-child relation. path, as defined in Eq. (1). the depths of the individual concepts, as defined in Eq. (2). of individual concepts in that method. individual IC of each concept (see Eq. (6)). concept instead of using its depth. minus twice the IC of the concepts‘ LCS (See Eq. (7)). nodes in the chosen taxonomy. this section, we describe both techniques. P(d )) , occurring in the same text as seen in Eq. (9). concept is seen in the corpus, respectively. (incoming) and descendants (outgoing) (see Eq. (11)). mining research in other fields. source, helping to aggregate and sort non-numerical terms. datasets which better preserves the utility of EHRs. its high correlation with human judgments. overcome the limitation of a suitable corpora availability. ontologies is organized in a meaningful way. biomedical that several knowledge sources are available. multiple ontologies (SNOMED-CT and MeSH). that experts classify ontological concepts manually. use in natural language processing. archetype terms to an external terminology, SNOMED CT.
to enrich the analysis of unstructured data located in EHRs. discrimination between documents of different classes. correlation with expert judgments in empirical evaluations. measures that used SNOMED-CT as an input ontology. from 1 (non-similar) to 4 (identical). The proposed measure used a broad taxonomic knowledge. mining research in biomedical informatics. support maintaining and developing ontologies. 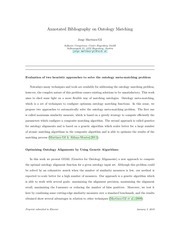 and relevant for ontology mapping and ontology alignment. create templates for the purpose of harmonization. it was used to support classification of radiology reports. analysis of unstructured data located in EHRs. techniques, so as to support classification. ranked by eight medical experts, ranging from 0 (nonsimilar) to 1 (identical). multiple ontologies (such as SNOMED-CT and MeSH). measures and other measures in the biomedical domain. obtaining a high correlation with human judgments. set-based to IC-based with intrinsic calculation. approach in relation to related works. measures were compared based on the Pedersen et al. higher disambiguation accuracy than the other measures. human ratings in all of six tested measures. This file has been shared by a user of PDF Archive. Document ID: 00548684.